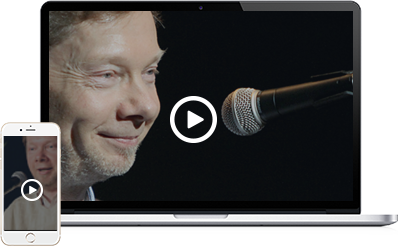 In This FREE Inteview Training One of the World's Most Spiritually Influential People, Eckhart Tolle, Shares the Secrets to Ending Compulsive Negative Thinking Once and For All, and How You Can Experience True and Lasting Peace of Mind. How to break free of the conditioned response to worry incessantly, so you can sit in peace and stay present through the midst of challenging life circumstances without stress or strain. Why it is so important to disidentify with the ‘voice in the head,’ and the stream of compulsive thinking which has no real purpose and adds no benefit to your life or the lives of others. How to break the flow of thinking which leads to stress, so you can connect in the present with your situation and even reverse the damaging effects of stress on the body and mind. Why the true nature of the present moment is inherently peaceful, and how you can tap into this state of being at anytime, anywhere. Why your body cannot distinguish between your thoughts and reality, and how you can cultivate the right kind of thoughts to create a radiant and positive personal energy. How to escape the conditioned ‘flight or fight response’ that is so common on 'Planet Fear,' so you can engage with what is happening around you here and now in the present moment with increased and vivid awareness. Eckhart Tolle is a spiritual teacher and author who was born in Germany and educated at the Universities of London and Cambridge. At the age of 29, a profound inner transformation radically changed the course of his life. New York Times has dubbed Eckhart Tolle as “the most popular spiritual author in the United States”, and the Watkins Review also listed him as “the most spiritually influential person in the world”. Eckhart Tolle’s #1 New York Times bestseller The Power of Now (translated into 33 languages) and the highly acclaimed follow-up A New Earth, are widely regarded as two of the most influential spiritual books of our time, selling collectively over 10 million copies.